Turkey has entered a period of stability for the next four years, following the March 31 local elections, European Commission spokesman Margaritis Schinas said Saturday, as he highlighted the commission's stance regarding Turkey's EU accession despite calls on the bloc to suspend the process. 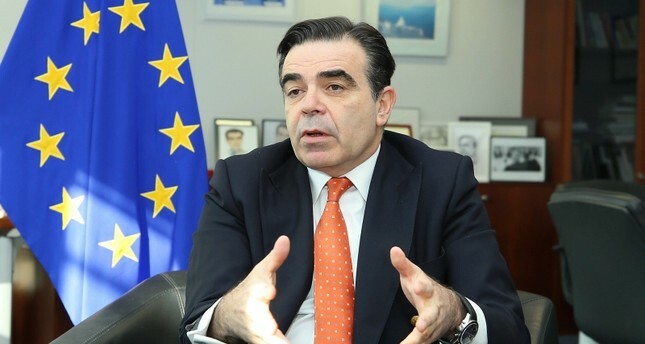 In the wake of Turkey's recent local elections and in the four-year run-up to its next elections, set for 2023, "Turkey will go through stability without electoral processes for the next four years, and we should see this as an opportunity," said European Commission spokesman Margaritis Schinas. In an exclusive interview with Anadolu Agency (AA), Schinas rebuffed calls to suspend Turkey's EU negotiations, saying doing so would require the consent of all member states. "The hinges are reform, the rule of law and democracy. If we get this part right, together with everything else that is on the table on Turkey's pre-accession, the door will remain open," he said. The commissioner stressed the importance of Turkey and the EU cooperating in the fight against terrorism as well as on immigration, intelligence, trade, transport and energy. Since 1987, Turkey has been trying to obtain full EU membership. Toward that end, many reforms were made in Turkey's domestic policies. Despite this, it has experienced many ups and downs in recent years, as the EU has frequently accused Turkey of drifting away from European values and democracy. On the issue of visa liberalization, which Turkey has been pushing for since a March immigration 2016 agreement that included liberalization, Schinas said that Turkey is expected to fulfill its obligations to get visa-free travel. Turkey "opening its doors to 3.6 million Syrian refugees as the country that hosts the most refugees [in the world], thereby [it] has made a great achievement in the eyes of the EU authorities," said Schinas. Ankara and Brussels signed an agreement in 2016 to find a solution to the influx of refugees heading to the union. According to the deal, Turkey was promised a total of 6 billion euros ($6.79 million) in financial aid, which was initially designed to be given to the country in two stages and be used by the Turkish government to finance projects for Syrian refugees. Visa freedom for Turkish citizens was also promised under the agreement.